This is our ms Marco Polo deck plan review. See what is located where, and plan better your onboard fun activities by knowing all there is on the Marco Polo cruise ship deck plans of all passenger decks. MS Marco Polo ship is currently operated under charter by Cruise & Maritime Voyages. For more information follow these links for the complete Marco Polo cruise schedule, and the Marco Polo cruise ship review with a top of photos of facilities, venues and cabins. Our review of ms Marco Polo deck plans will show you all the ship’s cabins location, along with all facilities and public rooms – bars, lounges, restaurants, pools, etc. You can also check the following link redirecting to the ship’s dedicated article at Wikipedia. If you need to print them or use them on the ship via some electronic gadget (tablet, smart phone, laptop, etc), here you can download the ms Marco Polo deck plans PDF. This link opens in a new window, where you can save it as a file using right mouse button and the “save as” command. Another method is to click right mouse button on the deck plan pdf-link here and choose “save link as”. On this page, the Marco Polo deck plan is presented as thumbnailed images. Each of them opens in the same window. You can zoom in for better viewing (click “Back” to return to the main page). 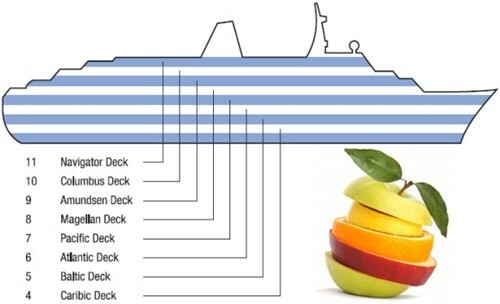 There are 11 decks on mv Marco Polo cruise ship, with 8 of them passenger accessible. The remaining 4 decks are often called “hull decks” (located below waterline). There are located all the cruise ship crew cabins, storage areas, engines, etc. Spa / Wellness & Fitness Centre (with sauna, hair salon, massage rooms). 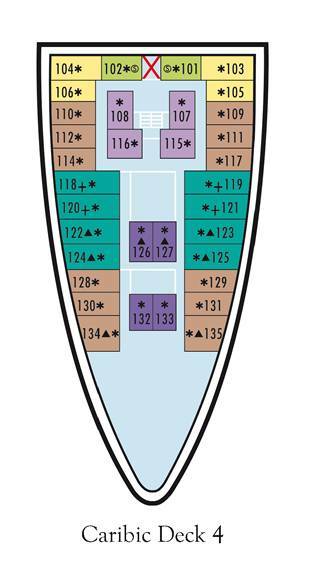 This is the deck plan legend to show you additional details on Marco Polo ship cabins (as category) by color. Soon we will add a detailed review of all staterooms as to sizes, amenities, etc, with photos. and 4 Standard Twin Inner (cat 1). 12 Standard Twin Inner (cat 1). 16 Standard Plus Twin Inner (cat 2) rooms. “Waldorf” is a 2-seating dinner restaurant (6 pm & 8:30 pm), and with open seating for breakfast/lunch. Waldorf” is one of the two main dining rooms on board. This dining venue requires formal dress code. and 22 Premium Twin Inner (cat 4). The Marco Polo ship Deck 8 is named “Magellan”. This is the “entertainment deck” where all the venues for “fun ship activities” are located. Their list starts with the “Marco Polo Show Lounge”. The “Marco Polo Lounge” (located at the bow of the ship) serves as a movie theatre, but mostly for live evening show productions. Here you can enjoy performances by young singers and dancers, with a live band for the shows. “Captain’s Club” is a stylish club venue with a resident pianist. This is your place most to enjoy your pre-dinner cocktail. Reception Desk, Cruise Tour Office, Main Lobby. “Columbus Lounge” serves as classy bar and alternative dining venue. “Nansen Card Room” and the “Livingston Library” are also here. “Marco’s Restaurant” is the ship’s second main dining room with 2 buffet lines. This dining venue is casual as dress code for breakfast and lunch, but, just like at “Waldorf”, dinners are always with formal code. “Marco’s Bistro” (now renamed to Marco’s Restaurant) is a relatively small dining room located aft by the swimming pool. This venue is most visited at breakfast and lunch. The Swimming Pool area has loungers, tables and chairs, and an open bar. 34 Superior Twin (cat 9) rooms. The ship-round promenade is perfect for your jogging exercise and romantic evening strolls. The “Scott’s Bar” is very cozy (located aft). It has a small stage for easygoing entertainment. and 14 Superior Twin (cat 9) rooms. On this deck are also positioned the ship’s 10 lifeboats and the “Internet Cafe”. The Marco Polo ship’s Spa Complex is also located here (aft location). It has a “Beauty Salon”, sauna, several massage/treatment rooms. All these facilities are relatively smaller in size compared to those on newer and bigger ships. 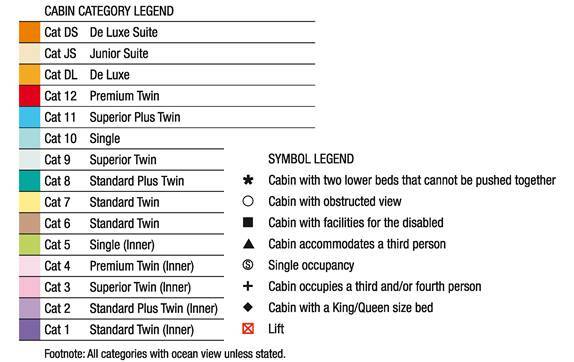 and 18 Premium Twin (cat 12) Oceanview cabins. 3 of all 4 elevators have access to this top deck. You can share Marco Polo cruise ship deck plans via our social buttons. Happy CMV Marco Polo cruises!